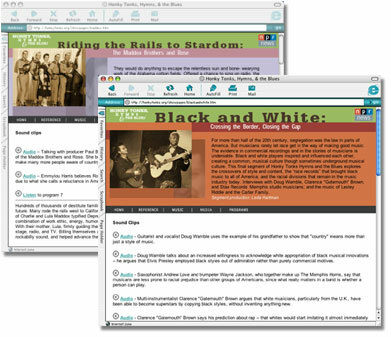 Honky Tonks, Hymns & the Blues, highlighting American music from back roads to big city, ran in eleven segments on NPR’s Morning Edition ® (7/4/03- 9/12/03) with an additional feature on Border Radio at the Honky Tonks website. The weekly segments explored roots music with historic performances, rare archive tape, and interviews with artists including country legend Merle Haggard, blues men Honeyboy Edwards and Taj Mahal, and fiddle greats Alison Krauss and Mark O'Connor; all tied smoothly together by host Paul Brown. In 2005, Paul Brown opened the Dance Hall door to bring listeners legendary musicians and captivating sound with two summer holiday specials. In 1927, dozens of rural, mostly amateur musicians from the mountains of the upper South streamed into Bristol, Tennessee – many by horse and wagon – to try out at a mega recording session organized by Victor Records. Their desire -- to get that big break, and get off the farm. The company’s idea -- to find new talent for its roster of hillbilly artists. Victor made two huge discoveries: The Carter Family, with a riveting, wholesome sound driven by great singing and powerful guitar work; and Jimmie Rodgers, a carefree, yodeling, guitar-picking railroad man who broke away from his string band to try a few songs on his own – and would become the first true superstar of country music. As we tell our story, the connection between Delta blues players and ladies’ parlor music of the elite Northeast starts to emerge and we’ll hear the start of the evolution of the guitar in America, the dominant instrument in popular music. It was small, and portable. It could sing like a bird or wail like a bluesman. Musicians from all across the European continent brought the fiddle when they came to America, and gave it fresh, new voices as they melded European and African influences. This versatile stringed box dominated country music in the first part of the 20th century. 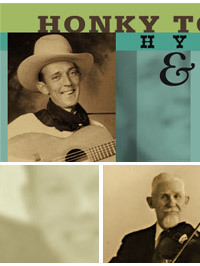 In this hour, we’ll hear the haunting sounds of early white and African-American fiddle bands, find out about aces like Eck Robertson and Fiddlin’ John Carson, who showed the record companies that rural music could sell -- and meet a charismatic Texan named Bob Wills who came from a sharecropper’s childhood to redefine the fiddle sound and pack dance halls with his Texas swing.